Rambling Through Parenthood : Win Tickets to The Jungle Book Live! Win Tickets to The Jungle Book Live! The Jungle Book Live is on tour and will be visiting The Lowry, Salford Quays, Manchester from 2nd to 6th May. Rudyard Kipling’s endearing tale about the human child brought up by a pack of wolves, reared as one of their own, and his journey of discovery, has been a firm family favourite through the ages. Children’s Touring Partnership and Royal & Derngate, Northampton bring us a brand new adaptation, complete with a new score and script. The show is suitable for ages 6 years and above. 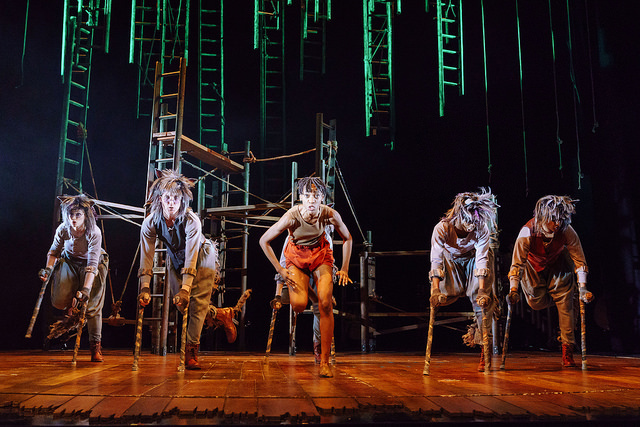 In conjunction with The Lowry, I am delighted to offer one of my lucky readers a family ticket (4 tickets) to watch The Jungle Book live at The Lowry. The winner will be able to choose a time that suits them, between Wed 2 to Sun 6 May 2018 (Times: Wed to Sat at 7pm, Wed & Thu at 1.30pm, Sat & Sun at 2pm). Just enter via the Rafflecopter below to be in with a chance of winning this fabulous prize. It will be the perfect family treat to kick off the Bank Holiday weekend. Good luck! The prize winner will have to make their own way to and from the show. Tickets cannot be transferred to another show if the winner is unable to make the week of the show. The four tickets can be used in any combination eg 2 adults & 2 children, 1 adult and 3 children but children must be accompanied by an adult. Additional tickets can be purchased next to the competition tickets if the winner wishes to bring more guests. For more information about listings, show times and facilities, please visit The Lowry website.